Exercise your imagination as well as your body with a new generation of strange alternative sports. We try them out. 'It doesn't hurt.' 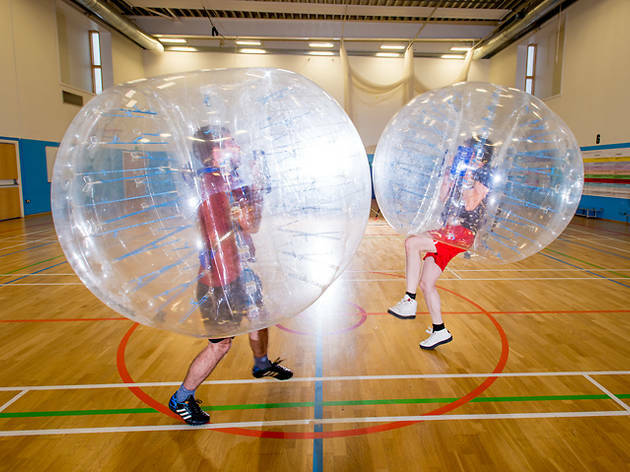 Bit of a weird thing for an instructor to say before a match, but bubble football isn't a normal kickabout. Before the game starts, you're helped into an inflated sphere that makes you look like a giant beach ball. 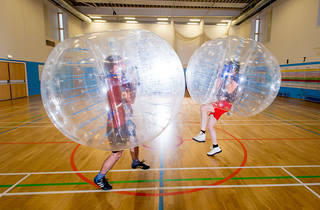 Once encased in your see-through 'zorb', you can safely knock fellow players clean off their feet and the result is a sport that involves as much shoving as actual skill. Around the tiny fluorescent green football is a scrum of fellow bubble 'ballers. And, strangely, I have an uncontrollable urge to charge at them like a bowling ball. Luckily, I don't need to suppress this urge as we end our kickabout with a couple of different games, including bulldog: the playground classic where you run across a room, trying not to be caught by the 'bulldog'. Except that here, it's less a case of getting captured and more being bounced to the ground. Things get even bouncier when weíre lined up in two teams at opposite ends of the gym, given numbers and made to charge at each other at full pelt when our numbers are called. It doesn't hurt so much as mess with your instinct to not barge into other humans. Also, it's pretty sweaty. Be warned: we were drenched within minutes. Still, once you get over that, you'll be clobbering your mates like there's no tomorrow. Thanks very much @GoldBarsDj and TimeOut. Hope you're good!